The Loop Phone Booth was designed to accommodate the need for privacy in open concept office and work spaces. Our office phone booths increase productivity by allowing workers to take a private phone or online call without occupying conference rooms or having to find a private area far from their work space. What is a Loop Phone Booth? People are more connected than ever before, and the spaces that we work in, travel through, or occupy are a reflection of this. From open concept and co-working office spaces to busy airport terminals and large public areas. Fewer and fewer walls divide the world around us. 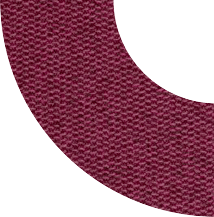 However, this movement towards openness and collaboration comes at a cost: privacy. The Loop Phone Booth helps fill this void by providing a quiet sanctuary to work, take a phone call, or simply to collect your thoughts. People who work in an open concept office can eliminate background noise and find their focus, even in the loudest of environments with a modern phone booth. 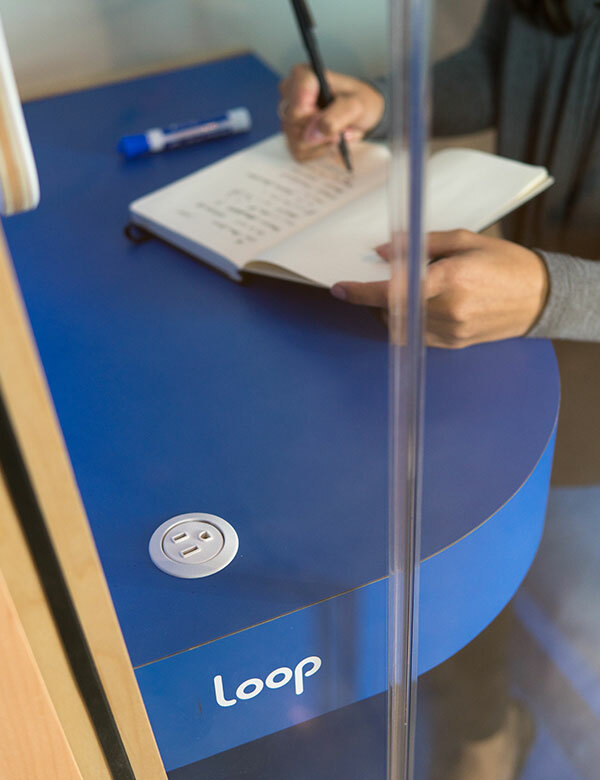 As an alternative to office cubicles, Loop Phone Booth solves the noisy open office dilemma by providing a quiet work space free of office distractions. And with our soundproof office phone booth, you’ll never worry about disrupting the focus of your surrounding colleagues again. Loop Phone Booths offer a simple, elegant, flexible solution to distractions and noise pollution in open concept offices. 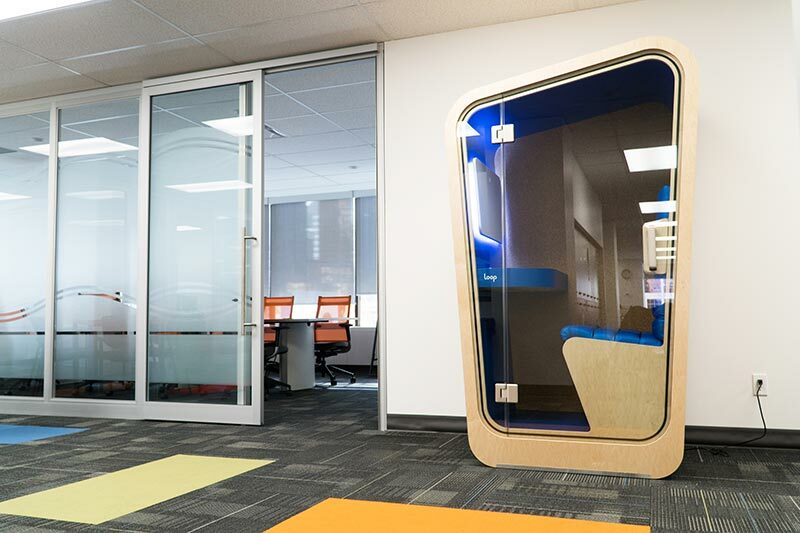 Placing Loop Phone Booths around the office increases productivity while adding a private space to contrast vibrant open areas. Adding an office phone booth puts an end to individually occupied board rooms, awkward stairwell phone calls, and disruptive loud talkers. 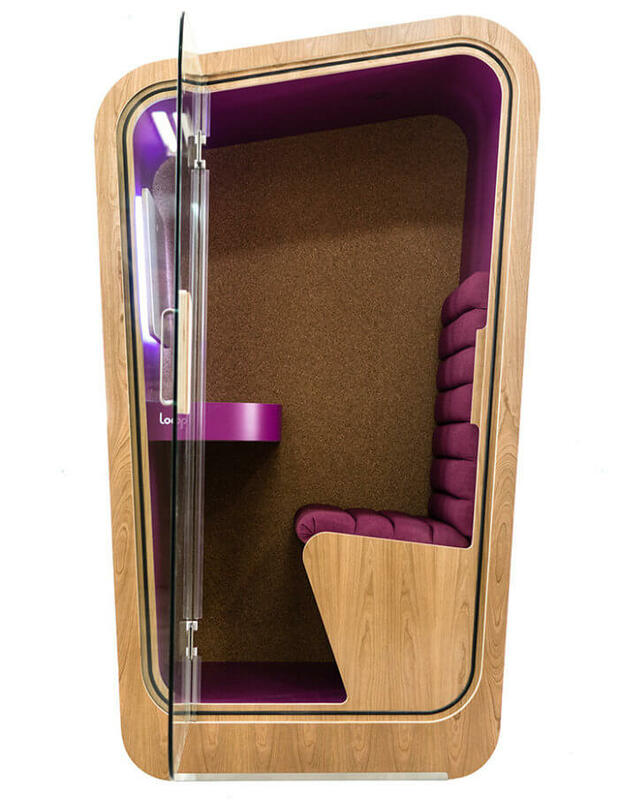 Our acoustic office pods provide an alternative to office cubicles while still maintaining a modern open plan. The number of coworking environments where multiple companies inhabit a single space has exploded in recent years. Designated desks with PC’s and enclosed board rooms are being traded in for laptops, bean bag chairs, and breakout spaces for diverse ideas to collide. Information sharing and collaboration are the new kings of corporate culture. But even in this modern concept of a work environment, there are still conversations that are best had in confidence. 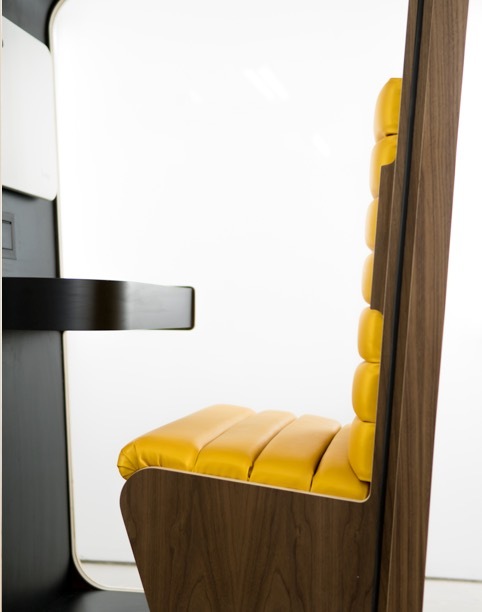 Loop office phone boothsoffer an office furniture solution for ever-evolving, innovative work environments. Airports, bus terminals, and train stations feature large open areas filled with concentrations of people that can be difficult to find an escape from. For business passengers, this can lead to frustration. Imagine the sense of relief knowing that a private, focused, uninterrupted phone call in a Loop Phone Booth is just a short stroll from the gate. Adding privacy phone booths to a transportation terminal results in happier travellers and a better experience for everyone. 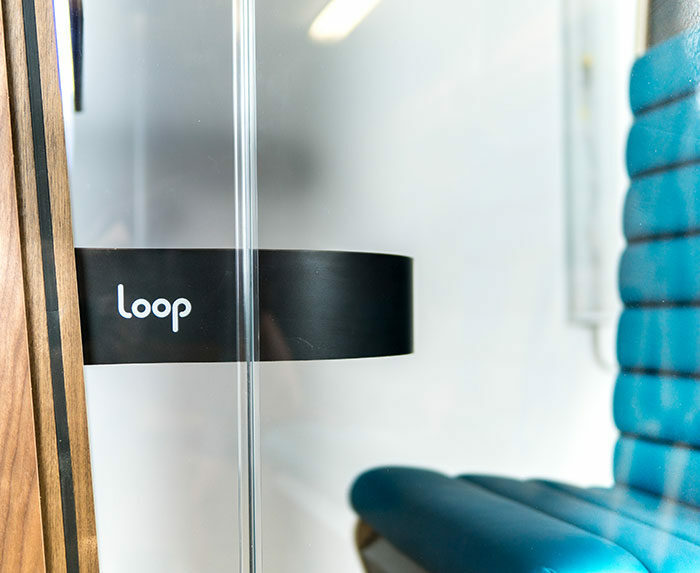 Create soundproof private spaces with Loop. Public spaces have never been great for moments of privacy. However, what if your call is what becomes the distraction for those around you? Where do you FaceTime in a library, hospital or event? The Loop Phone Booth is the perfect acoustic solution for any public space. Just step inside our noise cancelling booth, sit down, and relax knowing that your conversation is not going to irritate those around you. Why use a Loop Phone Booth? Enjoy privacy inside the Loop Phone Booth surrounded by a carefully constructed sound dampening interior and 10mm glass door. Shipped in one piece, designed to fit through tight spaces, and the only plug and play construction on the market. 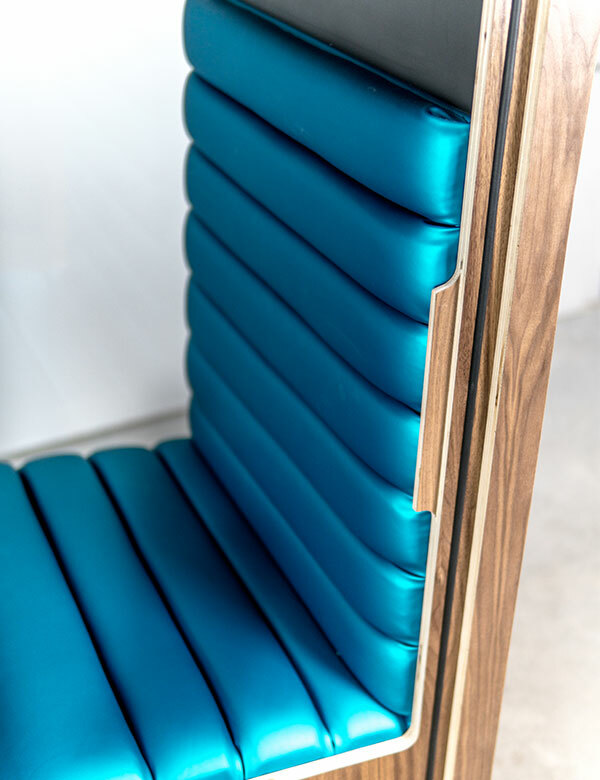 Our integrated bench seat has been designed and thoroughly tested for comfort no matter who is using the privacy phone booth. 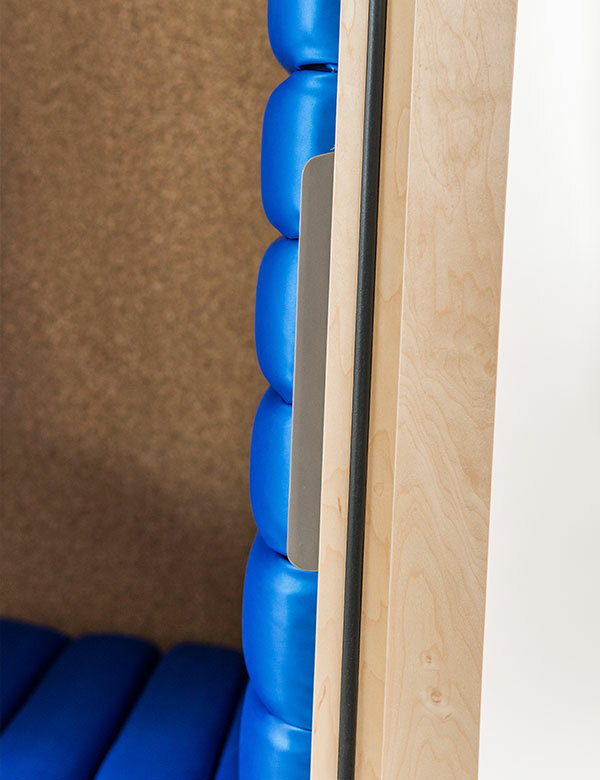 With such a wide variety of customizable finishes available on our soundproof booths, there is a combination to suit every interior. 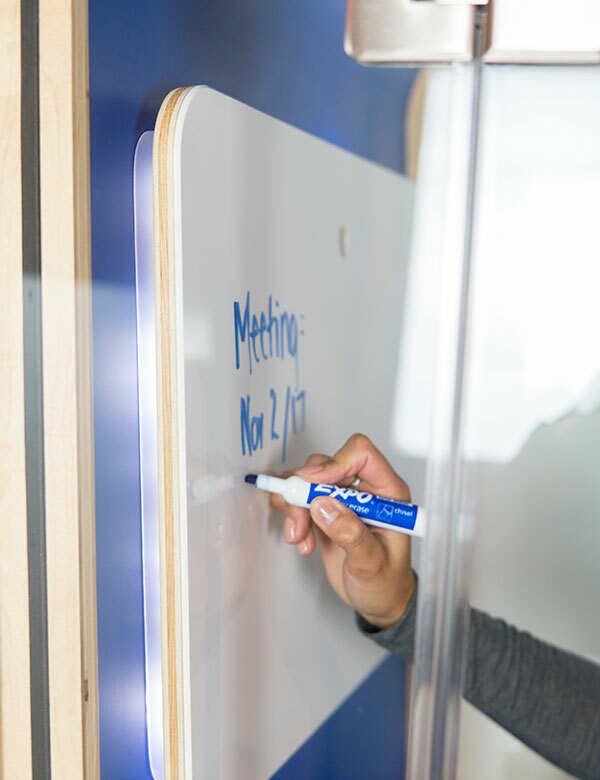 All of our phone booths come standard with a built in desk for laptops, whiteboard for making notes, LED light, and two fan circulation system. We offer our phone booths in a variety of electrical, network, and usb configurations to ensure that our booths meet your requirements. Designed and built to last with quality including a stainless steel kick plate, easy to clean laminate, and highly durable seat upholstery. 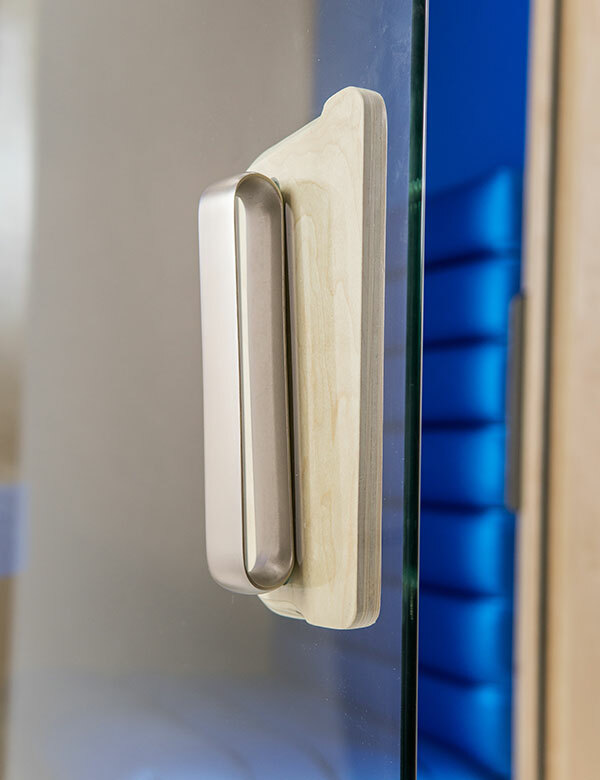 Our product stands out with its unique form and embraces the beautiful contrast between a warm wooden exterior and brightly coloured interior. What do the Phone Booths have? Looking for downloadable content for the Phone Booth? 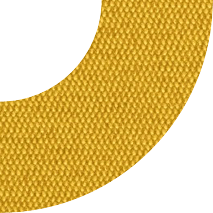 If you are looking for a 3D CAD file of the Loop to drop into your next project we have a variety of file types to choose from. Our downloadable catalogue is a summary of the features with photos and is great for presentations! Design your own Loop Phone Booth with our customizer tool. We offer a wide variety of customizable options on our standard phone booth for you to choose from. From interior and exterior finishes to a variety of electrical configurations, we can build a phone booth to suit any interior environment.